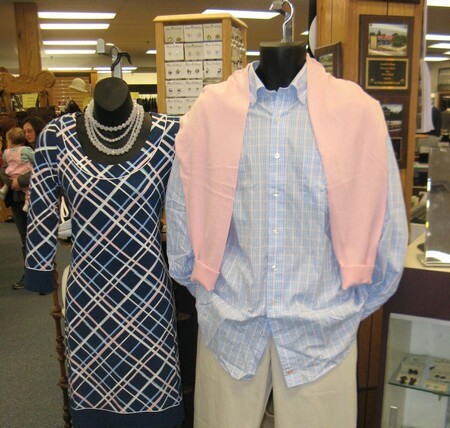 Gould's clothing for men and women is a family owned business with an emphasis on contemporary fashions and traditional values and service. Who we are is very much influenced by our past-we have strong ties to that bygone era when sales people knew their customers personally and store owners worked the sales floor. Most of our sales personnel have 10, 20, even 30 years of experience in the industry. Gould's is committed to customer satisfaction because we know it is the best way to insure that you will keep coming back. The first Gould store, called Gould's Outlet, was opened in Clinton, MA, in August 1934, with David and George Gould as partners. Their entrance into the retail apparel trade was engineered by their father, Louis Gould, who was a cattle dealer and butcher. David was 19 and George was 18 as they embarked on their retail careers. The fledging merchants struggled for several years, and there were many times they were ready to quit, but their parents would not allow it. Progress was painfully slow. The economy in the 30's was struggling to emerge from the deep depression- Dave and George had to share their time between working in the store and helping their father in the slaughterhouse. Finally, in their fourth year, the Gould's noticed some growth in their men's business. They discontinued the women's and children's divisions concentrating on the men's business. They moved to a new and better location on High Street in Clinton, calling their new store Gould's Men's Shop. From this point a steady but slow growth pattern was achieved. In 1953, The Gould brothers bought out an old established business, Burkills in Hudson, MA. The Burkills store was closed because of a fire. The store was remodeled and enlarged and another successful Gould's was launched. Two years later, the Gould's ventured into the women's business in an empty store adjacent to the men's shop in Hudson, naming it The Redwood Shop. Due to its success a second Redwood Shop was opened in Clinton in the following year. In 1968, the Gould's enlarged their Hudson store by adding 1500 feet to the rear of their building. A shop catering to boys, size 8-20 was added. The partition between the Men's Shop and the Redwood Shop was removed. The store was completely remodeled. The business continued to grow when in 1971; a new generation of Gould's entered the scene. George's older sons, Marvin and Arthur joined the Hudson organization. With the children entering the business, the founders, David and George decided to sever the original partnership, with David retaining ownership of the Clinton store and George taking over the Hudson store. One year later, the George Gould family built and developed the Gould's plaza on Great road in Acton. Included was the newest Gould's Men's shop and the Redwood Shop. Gould's Plaza turned out to be a most popular shopping area, drawing customers from all the surrounding towns. The store name was changed to Gould's, distinctive clothing for men and women. The Gould's shop continued with the same policy of quality clothing and friendly service, proved to be an instant success. Our business continued to grow through the 80's. The next move occurred at the end of 1988, when the Gould family acquired a small, colonial type, shopping center on busy route 109 in Medway, MA. The shopping center was only partially rented, and required an influx of capital and redesign. Several stores were relocated to accommodate the third Gould's shop. The plaza had a grand reopening in the fall of 1989 along with the opening of the new Gould's store. A third brother, Lester, who had also joined the organization, went to Medway along with their long time employee and manager, Edward Bigelow, from Hudson. The Medway location was open until 2006. We now serve our customers from our Acton store on Route 2A, in Acton MA.